Featured on ABC’s Shark Tank! 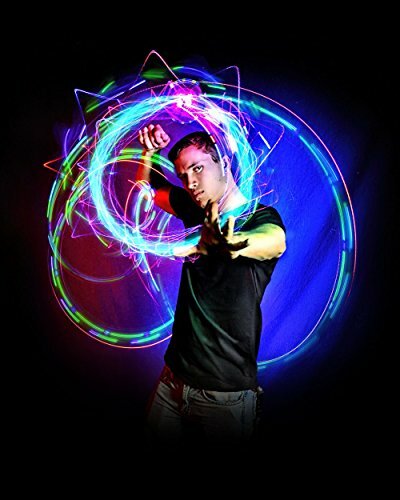 Giving a Light Show is about building a connection with your audience and expressing yourself through kinetic movement. Orbiters use a spinning LED disc on strings to create streaks and patterns of lights that mesmerize the viewer. In those few moments, your magic orbit becomes an extension of your emotions and an instrument to tell your personal story. The illusion of the art is the mastery of manipulating light and turning darkness into your canvas. Your orbit represents your personality, and the modes and colors you choose are just as important as the moves you string together. Great for all ages and easy to pick up, orbiting combines optical illusion, dance and rhythm, allowing you to create mind-blowing performances. This is a FULL orbit set – everything you need is ready to go right out of the packaging. Designed in the USA by our innovative engineers, this set utilizes our Orbite orbital casing and is built for optimal performance and maximum durability. All of our orbital sets include the Orbite orbital casing, batteries and 4 ready to go microlights. Don’t be fooled by cheap imitations; orbit like the pros with this EmazingLights orbital set today! *Colors in picture may vary from actual tint. We try to capture our LED colors are precisely as possible. Perk up your business with these string lights and stand out from the rest. Attach around signs to make them more eye catching, or decorate across your restaurant for am inviting ambiance. Use as outdoor string lights that can be arranged around plants, flowers, furniture, doors, windows, staircases, balcony, patio umbrella. Celebrate the New Year, Birthdays, Christmas and special holidays with these party string lights. Small and easy to hide battery compartment. No need to find an outlet, simply switch them on and enjoy these amazing fairy lights. Great for use in a restaurant, bars or a small business. Light up and liven any living space in creative ways. HIGH QUALITY: GlowCIty stands by our Electroluminescent (EL) Wire, when you purchase from us not only are you getting a great product but also great customer service. DURABLE: Our EL Wire is very durable it can be bent in any direction. It can be sewn, stitched, and super glued to any project your working on. CREATE ANYTHING: El Wire is great for lighting up anything for the dark or night time use. Its great for creating light up Halloween costumes,decorations, and so much more. Lighted slippers that let you see in the dark! The perfect gift for any occasion. See in the dark, feel the comfort and enjoy the convenience.